Tomorrow Microsoft will bring dramatic 3-D mapping to the browser window. Windows Live is set to launch photorealistic 3-D imagery for the “urban core” of 15 U.S. cities: San Francisco, San Jose, Seattle, Boston, Philadelphia, Los Angeles, Las Vegas, Detroit, Phoenix, Houston, Baltimore, Atlanta, Denver, Dallas and Fort Worth. An image of virtual San Francisco, as provided by Microsoft, is above. Microsoft has already built out 3-D terrain imagery on a near global basis and the company has said it wants to expand 3-D imagery to all major U.S. cities and those around the globe. 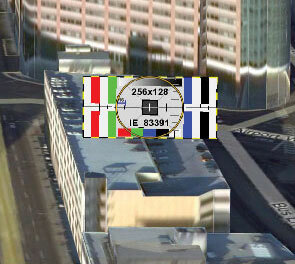 The 3-D imagery will be another view, available beside the 2-D existing aerial views, which include Bird’s Eye. Microsoft already offers real-time traffic information and will do so in the 3-D environment as well. All the features of Live Local, including collections and local listings will be available in the 3-D environment. As it hasn’t been sold, a “test pattern” style image serves as a placeholder. Consider also that video can be embedded in these slots as well. There are also numerous e-commerce scenarios. Recently, brand advertisers have been tripping over themselves to get into the virtual world Second Life. Live Local 3-D isn’t that far away, representing an interesting evolution of dynamic mapping toward gaming. To that end, there are many social media possibilities in the new 3-D environment – Collections is just the beginning. Last year Microsoft bought Vexcel a company that developed a super high resolution camera and 3-D rendering technology, among other technology. Microsoft’s Erik Jorgensen said that most of the 3-D rendering in the new views of Live Local were done on an automated basis, with some minor human intervention after the fact. This means the company can scale these 3-D models quickly for cities around the globe. Taking a step back, the mainstream use case of mapping is still driving directions. But don’t dismiss this as novelty. The engagement that 3-D mapping will drive will be considerable and the browser availability will make the product more accessible to audiences than Google Earth is currently, as a download. As more and more layers of information are embedded in 3-D mapping it moves from novelty to utility. There’s much more the think about and discuss with the new product, which I haven’t yet been able to test. But it’s safe to say that this is a dramatic next step in online mapping and that the whole segment is just getting more and more interesting. MSN Virtual Earth was announced back in May 2005 (see MSN Virtual Earth To Take On Google Earth. Virtual Earth was to feature “Bird’s Eye” view of buildings. MSN Local Search (with “flat” aerial maps) launched in June 2005. MSN Virtual Earth launched in July 2005 but without the Bird’s Eye images. MSN Virtual Earth became Windows Live Local in December 2005 and gained the bird’s eye images. The former “Virtual Earth” name (which was excellent) got sucked up by the Microsoft turning all of its search properties into the Live brand. Virtual Earth only survived as a “powered by Virtual Earth” mention o the Windows LIve Local site. Well, supposed to be live. They’re promised, but so far, I can’t get any of them to render. In addition, Firefox is not supported. You want to see the 3D cities? You gotta use IE6 or IE7, then download a 500K setup file, then downloading another 5MB file. That’s a pain, and a far bigger download than Microsoft suggested would be required when I spoke with them about the new service. Then again, Google Earth is a 15MB download. 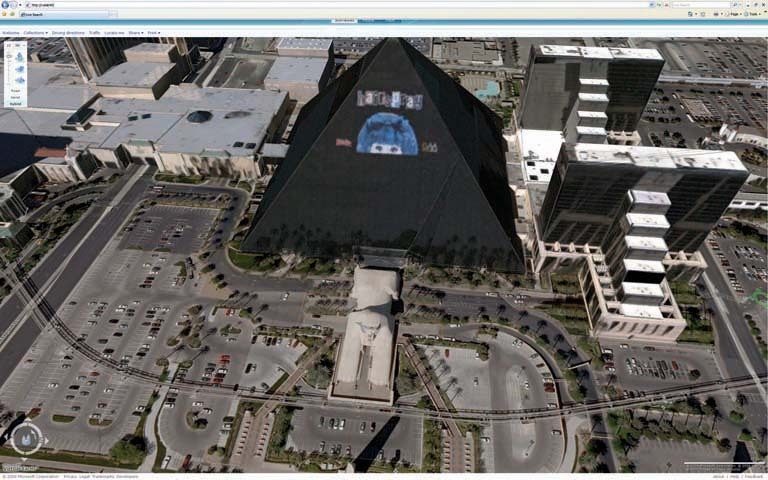 Yes, that looks like a Pac Man monster on the side of the Luxor pyramid. But it’s not — instead, from the Microsoft press release image here, it’s a promo for the play Hairspray. The quality isn’t as good, but it’s certainly not bad. Many more non-live photos can be found in the release.